KCON LA had a huge schedule of panels and showcases this year, and that allowed fans to connect with any number of people, from industry insiders such as producers to YouTubers. The H1GHR MUSIC panel was packed wall-to-wall with fans trying to get close to Cha Cha Malone, Woogie, and Thurxday. These producers talked about their experience in the industry, keeping it light as they chatted with fans and gave an inside look into what they do. 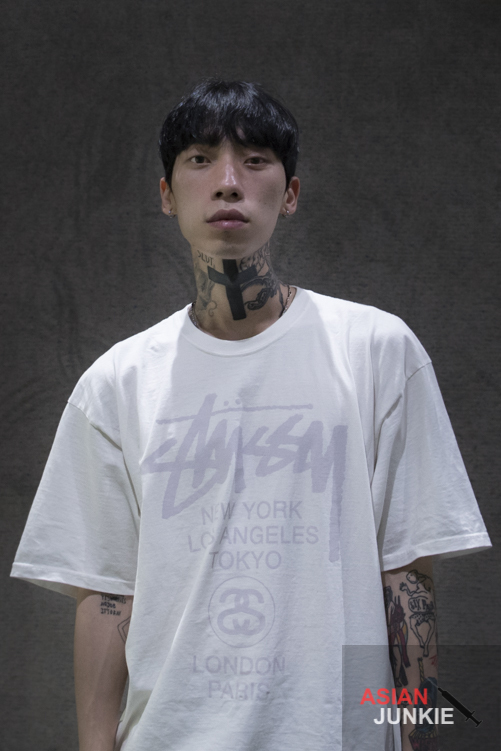 Thurxday caught my attention as he was this tattooed, brooding man who sat quietly during the panel, answering questions when they came in his own stoic yet charismatic manner. I wouldn’t quite call him tsundere, but he’s definitely mysterious. I had questions. So of course, I made it my mission to get to know him and introduce him to all of you. 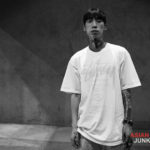 We were granted the opportunity for a quick interview with Thurxday on the last day of KCON and I couldn’t pass it up. we met at the front of the LA Convention Center and navigated our way through the halls, stopping as fans gingerly asked him for selfies. As we set up the interview he was looking a bit exhausted and pale, and it occurred to me as we set up audio that he hadn’t eaten. Luckily, yo girl always carries snacks, so I handed him a fun-sized PayDay bar and his whole face lit up. He thanked me and tore into it. As we continued to set up, I handed him another, after which he blurted out “Oh! I love you!” as he grinned. I realized that he’d flown for half a day to get to LA and then came straight to KCON with zero chance to rest, survived the panel and fans swarming him, and now had this interview to get through. So of course, I found the only way I could to show my appreciation; I fed him. His energy perked up and he smiled this charismatic grin. The interview ended up going perfectly, especially since it was in English. 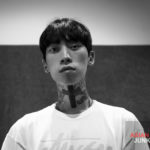 Asian Junkie: I am here with Thurxday from H1GHR MUSIC! Thurxday: Hello, I am Thurxday. My Korean name is Choi. I sing, make music, and am a director of fashion. AJ: I didn’t know that! I knew you were into music but I had no idea were into fashion. TH: It all happened at the same time. I’ve directed fashion and produced music for rappers and singers. I do everything. AJ: How were you introduced to H1GHR MUSIC? 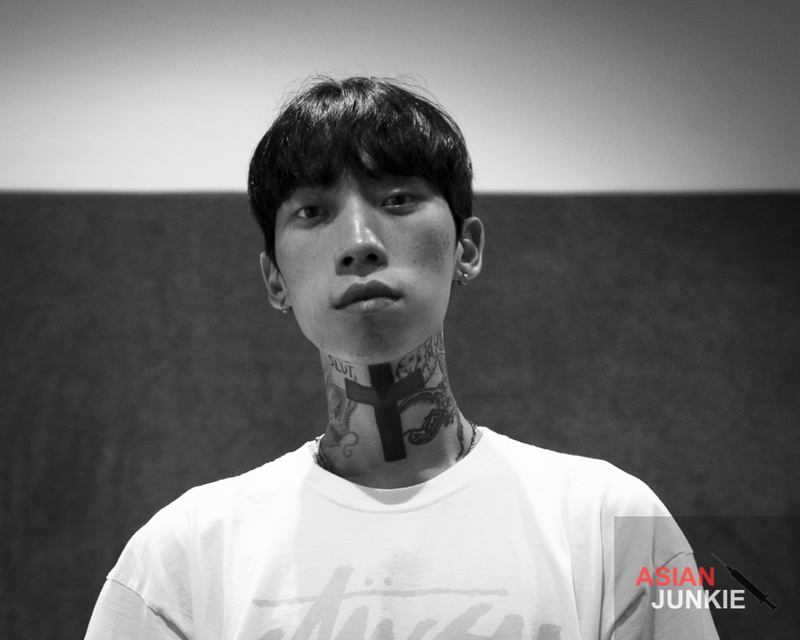 TH: I met Jay Park and we had a listening session. He listened to my music and said, “You’re crazy! Let’s sign you! Join me!” So I said okay and just went with it. AJ: How would you describe your musical style? TH: My style? Hmm … my influences are old school. Retro music, boom bap, folk, and pop. U2 and 2Pac. AJ: Your music tends to be more heavy and dark, more emotional. What’s behind that sound? TH: It’s a reflection of my personality and my depression. AJ: So you have depression? TH: Yeah. I have lots of depression. Every day I’m just so down, like my energy level. It reflects in my music. AJ: You’ve produced other artists’ music but are you also working on your own music? TH: Yes! My album is coming! All of the songs will be sad songs though. No club bangers. [Everybody laughs.] I like more folk sounds. AJ: Are there other artists that you’re working with right now? TH: I produced pH-1‘s entire album and continue to work with him. I’m also working on Jay Park’s new music. Loco‘s new single as well. AJ: And if you could work with anyone in the world, who would you collab with? AJ: Is there anything else you’d like to say to your new fans? TH: I’ll be working on my own music now so please anticipate it. Trust my voice, it’s got energy but is also humble. So please look forward to it. Personally, I cannot wait for his own album, as the music he’s produced for everyone else has been so incredibly good. Thanks to Thurxday (SoundCloud/Instagram) and H1GHR MUSIC (Facebook) for allowing us to conduct this interview.